APRIL UPDATE - IS IT REALLY THAT GOOD? Rails continue to be greater than last year. This statistic confirms that things are better, but I'm remaining intent on seeing a move up in the rate of change of the tonnage rather than just a parallel shift higher. If it remains where it is, we get to suggest that we're recovered, but not getting better. Auto shipments continue to outpace last year, and interestingly the rate of increase in the data suggests that we may see an increase in sales too (an increasing push higher). I reviewed Ford and GM's charts and there is nothing there that would make me want to gamble on a bet that this increase will translate to higher prices. The freight shipping for scrap continues to be flat and equal to last year's performance. I highlighted CP last month as a target for a short simply because in comparison to the rest of the rails, the tonnage versus last year is weak. Canadian Pacific continues to under perform and if we would have made a trade on it, we would have been rewarded handsomely. The trend remains intact this month and based on the stock charts, I am seeing continued weakness. I will not post a chart of CP yet, but it is pretty close to signaling a long-term short signal on the weekly chart. When I see this, I will post it. The last month has ushered in a drop in scrap prices. Perhaps this is a function of additional supply coming in driving prices lower? 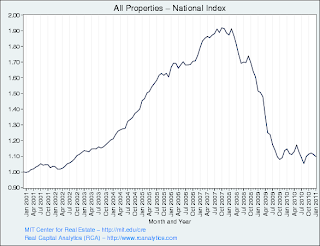 As of March 30th, 2011 the Moody's / MIT Transaction Index shows that prices slipped by another 1.25% in January for their total property index. For another perspective we can look at a recent article in the WSJ that describes a drop in occupancy rates in commercial space, namely in malls. http://online.wsj.com/article/SB10001424052748704101604576246972728969548.html . One might initially think that the big reits would be suffering, but the point of the article is that the suburban malls are getting hit fully by the never-ending recession that supposedly ended. The truth is that while Mom and Pop haven't been able to return to the crazy life-style that happened before the crash and those malls that sold them stuff they never could afford are feeling the pinch. So you thought that foreclosure you bought was going to be your ticket to a lavish Robert Kiosaki life-style huh? 2) Homeowners that want to sell that haven't listed because it won't sell or they are waiting for higher prices. 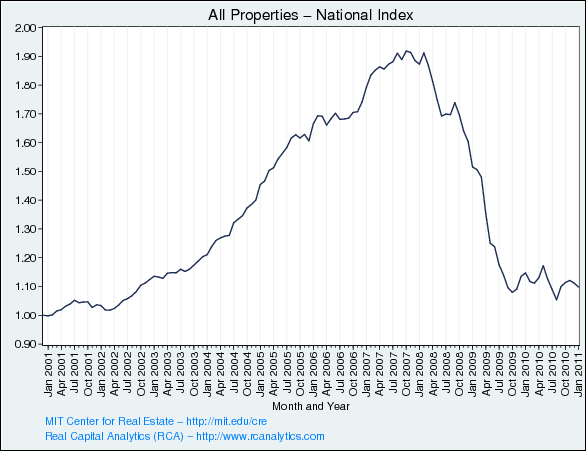 3) Homes that people are paying mortgages on, but are underwater.... when prices continue to drop, they'll quit. E) That government shut down thing. Because almost 1/3 of all mortgages receive a Federal Loan Guarantee, all those home transactions that might have been completed are now dead in the water if the shutdown is not averted in the next day. CNN contributes the following uplifting story stating that a full 11.4% of all homes in the US are vacant! Isn't it great that we have all those home builders adding more to the pot? The Monster Employment Index has been a pretty good indicator of jobs data and we see a big move up in the recent release of figures from Monster.com. This index powered higher to 136 which is the highest reading since July of 2010. Recall that this is an index of the number of job postings that employers put on their sites, essentially measuring online availability of jobs. Pimco's Andrew Balls wrote an interesting article calling the ECB strategy into question (just as I have for months). http://www.pimco.com/Pages/EuropesNotBackToNormalSoWhyIsTheECBHikingRates.aspx . No matter what, the ECB raised rates by 25 basis points to 1.25%. 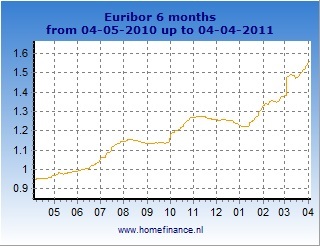 6 Month Euribor has been expecting this as we see it climbing significantly over the last couple of months. Funny though, look at the magic done here in the US! 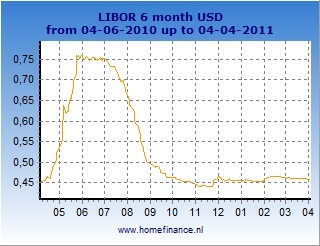 Oddly enough our USD Libor hasn't moved a bit! I wonder why? Perhaps it is just a tsunami of electronic money. Nothing can withstand something as powerful as a printing press. As I've noted quite often over the last months, I'm about to drop the Coppock Indicator, but have kept it around for entertainment purposes only. As I mentioned last month, the DJIA had to really drop and stay dropped to continue in it's bearish stance (which has been absolutely wrong). We did get a pretty sizable dump, but the resilient markets didn't stay dumped. Therefore, the Coppock has now turned bullish, signaling that all the kids can safely get back in the pool! If we would have listened to the indicator we'd have missed out on about 2500 Dow points. 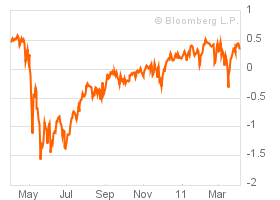 The Bloomberg Financial Conditions Index continues to recover. We are now at levels which are equal to the highest points we've seen throughout this entire recovery. While we saw a substantial drop, all has been made back. Levels above 0 indicate that there is a recovery in the works and expansion is underway. Below zero shows that we are in a contraction. 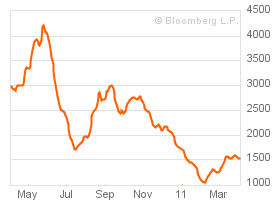 The Baltic Dry Goods Index is still in the basement. Not much going on here. Shippers like DRYS, FRO, GNK, and DSX all have very ugly looking charts. Continued weakness here in these names could easily push these guys down to their 4th quarter 2008 lows (which were much lower than the March 2009 lows.) GNK is already below those March levels. Bucky is still pegged at the lower end of it's range and is still at a critical juncture. 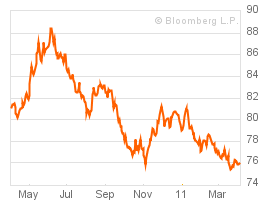 With all of this dollar weakness are we really amazed to see oil, gas, grains, food, and metals lift off? I've actually done a few things differently in this post than normal, so why stop there? Tonight I will not actually leave you with specific trades or much more commentary about specific areas other than to say that this data just isn't that good. We do have some improvement in jobs listings with Monster and also a move higher in the FCI. Beyond those items we see flat rail shipping, a collapsing housing market, falling commercial real estate still, and a really nasty spot shipping market for bulk goods. Is all of the recovery on the back of the falling dollar? Perhaps. If this is the case, it is not a wonder that commodities continue to perform well and the entire market too is being supported by the Fed's wealth effect. For the first time in a long time I'm seeing opportunities for to genuinely short where the charts look pretty weak and their current position in the recovery since the early March drop is well below the highs. Stocks need to regain that high point or are at risk for a reversal. I'm discussed at great length that portfolio managers and other big money will not wait for the end of QE II to be repositioning money and anticipating that the liquidity infusion will end. If that is the case, we could actually see a rotation from the high-flying stocks into more defensive names over the course of the next couple of weeks. Those would be companies in health care, utilities, and would certainly be out of technology leaders. I do have a number of stories ready to go in the next few days, so many that I actually inserted a few in the text here. So much is going on in the world that I really do feel that we are at an inflection point. Be Careful!